Public Health England, London, and GP with special interest in sports and exercise medicine, MICAS (Musculoskeletal Interface Clinical Assessment Service), Battersea Healthcare, Battersea, London. Health Improvement Directorate, Public Health England, London. Background Physical activity (PA) brief advice in health care is effective at getting individuals active. It has been suggested that one in four people would be more active if advised by a GP or nurse, but as many as 72% of GPs do not discuss the benefits of physical activity with patients. Aim To assess the knowledge, use, and confidence in national PA and Chief Medical Officer (CMO) health guidelines and tools among GPs in England. Design and setting Online questionnaire-based survey of self-selecting GPs in England that took place over a 10-day period in March 2016. Method The questionnaire consisted of six multiple-choice questions and was available on the Doctors.net.uk (DNUK) homepage. Quotas were used to ensure good regional representation. Results The final analysis included 1013 responses. Only 20% of responders were broadly or very familiar with the national PA guidelines. In all, 70% of GPs were aware of the General Practice Physical Activity Questionnaire (GPPAQ), but 26% were not familiar with any PA assessment tools, and 55% reported that they had not undertaken any training with respect to encouraging PA. Conclusion The majority of GPs in England (80%) are unfamiliar with the national PA guidelines. Awareness of the recommended tool for assessment, GPPAQ, is higher than use by GPs. This may be because it is used by other clinical staff, for example, as part of the NHS Health Check programme. Although brief advice in isolation by GPs on PA will only be a part of the behaviour change journey, it is an important prompt, especially if repeated as part of routine practice. This study highlights the need for significant improvement in knowledge, skills, and confidence to maximise the potential for PA advice in GP consultations. Advice from a healthcare practitioner has been effective at getting individuals active, but many GPs do not discuss physical activity (PA) with their patients. This study found the majority of GPs (80%) are unfamiliar with the national PA guidelines. 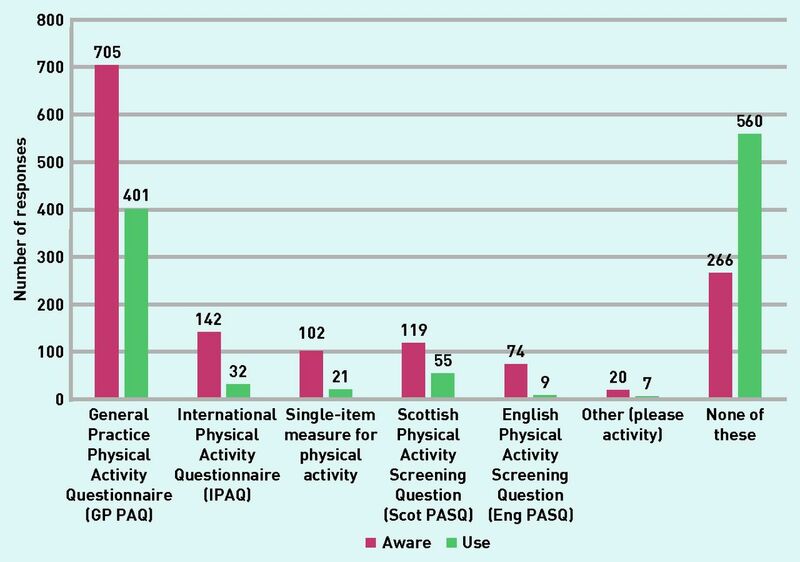 Use of tools to assess patient PA, such as the General Practice Physical Activity Questionnaire (GPPAQ), are within clinical guidelines and, though the majority of GPs are aware of them (70%), most do not understand or use them in practice, and are unconfident in raising the subject with patients. Knowledge of the guidelines increased the likelihood that a GP would know about the tools, use them, and raise the issue of PA with patients whose conditions could benefit. Provision of training on PA for GPs could increase patient behaviour change, resulting in improved clinical outcomes, as well as disease prevention. to identify whether, and with whom, GPs raise the issue of PA. The study was conducted between 16 March and 26 March 2016. The questionnaire was available at any time during this time period from any computer. The questionnaire had a multiple-choice question (MCQ) format, where one or more answers could be provided to each of six questions (Box 1). How familiar or unfamiliar are you with the Chief Medical Officers’ physical activity (PA) guidelines? Which, if any, of the following tools are you aware of to help assess patient PA? And which do you use? How well do you feel you understand how to use these tools in day-to-day practice? Which, if any, of the following training sessions have you undertaken with respect to encouraging PA? How confident or unconfident would you describe yourself in terms of raising PA with your patients? For patients with which of the following conditions would you discuss and recommend PA to? Individuals were given the option to leave more detailed comments for each question. Answers were automatically saved, which meant the questionnaire was not required to be completed in one sitting. Demographics also had to be provided. The survey was live on the DNUK website, with an invitation placed on the homepage of all GPs who visited the website during the study period. Participation was by choice of the individual. Quotas were used to ensure good regional representation and to mitigate regional variation in local initiatives. Quotas were based on the last workforce data showing geographical distribution of GPs through strategic health authorities. Once a quota was completed it was closed, so that no more GPs from that area could begin the survey. All GPs who were already in the process of completing the survey were allowed to finish it, and were included in the final sample. The survey aimed to reach a minimum sample size of around 1000 GPs to allow enough power in the study for analysis. A financial incentive was offered to encourage individuals to take part in the survey. Responders were only able to complete the questionnaire once, as the DNUK system only allowed a particular user to interact with the survey once. Responders were drawn from the DNUK community of General Medical Council (GMC)-registered doctors. Membership of DNUK required a GMC registration number, where members were matched to the monthly GMC register. Only GP partners, salaried GPs, GP registrars, and locum GPs who were based in England were invited to participate. Doctors in Scotland, Wales, and Northern Ireland were ineligible. Those who did not fully complete the questionnaire or answered a question that contradicted the inclusion criteria were excluded. When a regional quota was reached, no further responders from that region could participate. Non-doctors, and doctors who were neither GPs nor GP registrars, were ineligible. Data from each of the six MCQs were cross-matched against each other and also with the demographics to allow identification of any correlations. The t-test and 95% confidence intervals (CIs) were used to assess whether differences in results between the different demographic groups were significant. During the period when the study took place, the total GP membership giving a working address in England was 47 761. Of these, 11 654 GPs visited the DNUK website on at least a weekly basis. A total of 1415 GPs accepted the invitation to take part in the survey. Of these, 289 were excluded for not fully completing the questionnaire. A further 46 were then excluded for either providing contradictory answers in the survey (for example, reporting that they were both familiar and unfamiliar with guidelines), or if their answers indicated that they no longer met the criteria for inclusion, and 67 were unable to take part as their regional quota had already been met. The final analysis included 1013 responses. Most responders were male (57%, n = 581), GP partners (61%, n = 620), aged between 30 and 39 years (36%, n = 369), working in a practice with six GPs (range 1–30), had a patient population of 8994 (range 500 to 40 000), based in London (12%, n = 120), in an urban area (42%, n = 429), did not take an active part in their clinical commissioning groups (CCGs) (61%, n = 613), and did not work in a dispensing practice (82%, n = 830). The mean year of qualification from medical school was 1995 (range 1968 to 2010). 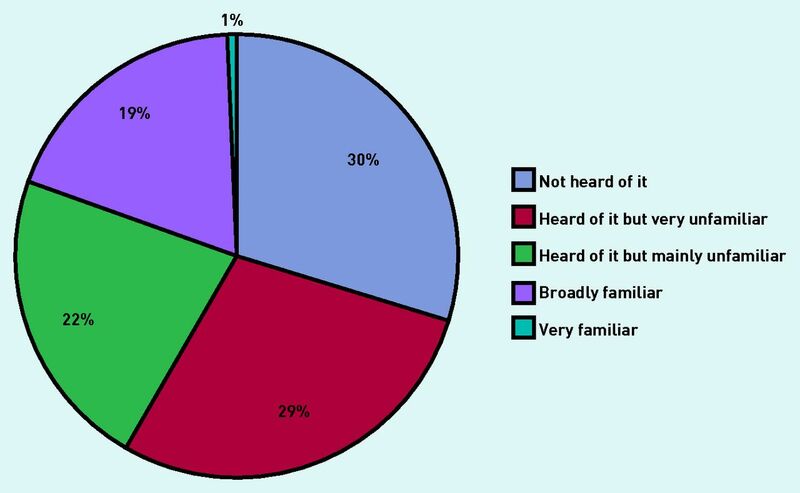 Of the GPs who responded, 20% (n = 198) were broadly or very familiar with the national PA guidelines (Figure 1), whereas 30% (n = 301) had not heard of the guidelines, and 51% (n = 514) said that they had heard of them but were broadly unfamiliar or very unfamiliar with their content. The survey asked specifically about the guidelines, rather than guidance that referenced them (for example, NICE guidelines), in order to understand the knowledge confidence around the age-specific recommendations for PA. Familiarity of GPs with the Chief Medical Officers’ physical activity guidelines. In all, 70% (n = 705) of GPs were aware of the GPPAQ, but 26% (n = 266) were not familiar with any tools at all (Figure 2). There was a statistically significant difference (P = 0.03) in knowledge of tools between those who were aware of the national guidelines and those who were not. Although 40% (n = 401) reported that they actually used GPPAQ in their clinical practice, 55% (n = 560) said that they did not use any tools at all. The percentage of GPs who were aware of and using GPPAQ was statistically higher (P = 0.04) among GPs who also said that they were familiar with the national guidelines. Conversely, those who were not aware of the CMO guidelines were also less likely to know about or use any tools (P = 0.04). Awareness and use of physical activity (PA) tools by GPs. 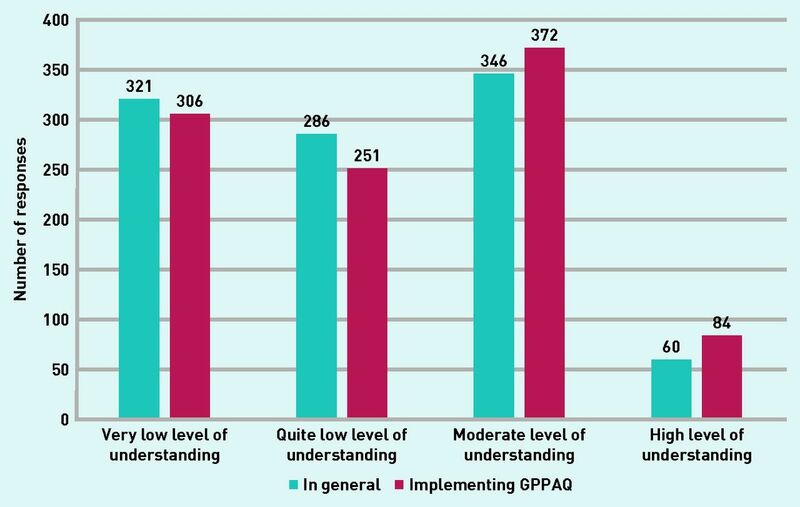 In general, 41% (n = 406) of GPs had a moderate or high level of understanding of PA measuring tools, but only 8% (n = 84) had a high level of understanding on how to implement GPPAQ specifically (Figure 3). Those who were more familiar with the national guidelines were more likely to have greater understanding and be more confident in discussing PA with patients. Comparison of the understanding of physical activity tools in general and GPPAQ specifically. GPPAQ = General Practice Physical Activity Questionnaire. In all, 43% (n = 439) of GPs were somewhat confident in raising the issue of PA with a patient, whereas 16% (n = 165) were either somewhat or very unconfident. Unsurprisingly, almost double the proportion of doctors in the group who were not familiar with the guidelines reported being unconfident when raising the issue with patients, compared with those in the group who were familiar. A total of 55% (n = 555) of GPs reported that they had not undertaken any training with respect to encouraging PA. Of those who had received some training, 20% (n = 202) were trained in use of the GPPAQ, and 18% (n = 180) had received training on how to deliver brief interventions to encourage patient PA. In terms of specific comorbidities, 15% (n = 151) of clinicians familiar with the national guidelines reported that they would recommend PA to patients with diagnosed cancer (Table 1). This is interesting, as there has been a sustained campaign by Macmillan Cancer Support (the UK’s leading source of cancer support) to promote PA.27 Clinicians not familiar with the national guidelines were significantly (P = 0.05) less likely to advise PA to patients with a multitude of disorders (Table 1). Awareness of both the guidelines and GPPAQ increased as practice size increased (P = 0.04), but levels of use of GPPAQ remained broadly similar. This may reflect the greater diversity of practitioners in larger practices. 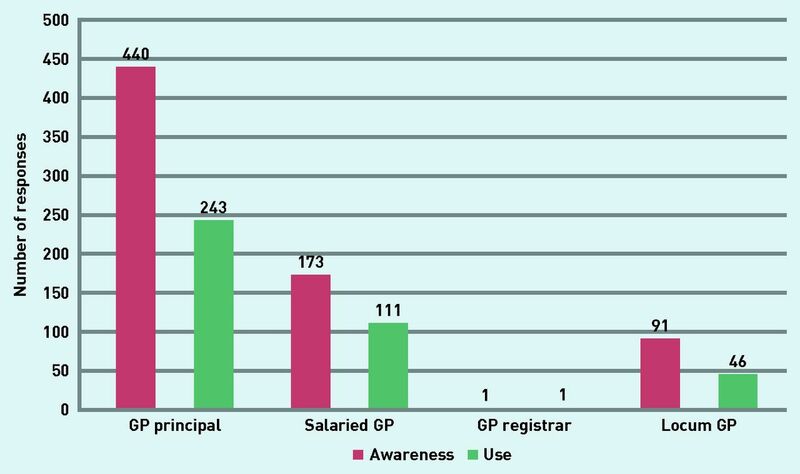 Locum GPs were less likely to be aware of GPPAQ than either GP partners or salaried GPs, but level of use was similar (P = 0.02) (Figure 4). A larger proportion of the salaried GPs and GP registrars reported specific training on PA than partners or locum GPs (Table 2). In addition, practitioners in age groups 30–39 years and 40–49 years were more likely to be aware of PA assessment tools than those in age groups 50–59 years or ≥60 years. Awareness versus use of GPPAQ by different types of GPs. GPPAQ = General Practice Physical Activity Questionnaire. Up until 2014–2015 there was a financial incentive to primary care in England to use GPPAQ to record patient PA under the hypertension Quality and Outcomes Framework (QOF).10 Potentially, removal of this incentive may have impacted on use of the GPPAQ, as studies have demonstrated that inclusion of a health parameter within a QOF leads to an improvement in care.28 Conversely, the GPPAQ was only included in the QOF for 1 year, and so the effect of incentivisation is not fully known. The results imply that the lack of skills, knowledge, and confidence in the guidelines may have been due to most responders not having had any form of training. The anonymity of responders encouraged participants to answer the questions honestly. However, some GPs may have struggled to admit lack of confidence in raising issues of PA, even to themselves, and therefore answers may not be truly reflective. GPs who were PA enthusiasts were more likely to participate in the survey. Therefore, this study may have underestimated the level of unfamiliarity of the CMO PA guidelines among all GPs. Study limitations included a lack of GPs in training among responders. Younger participants appeared to be more familiar with guidelines, and more knowledgeable and confident when using PA tools and so, if more of the responders were doctors in training, this may have been reflected in the overall trends. Nurses and healthcare assistants, rather than GPs, conduct much of the preventive screening of patients in general practice. Thus, a major limitation of this study is that this group of individuals was not included. There are several patient-centred studies that have investigated awareness of PA guidelines, beliefs about activity, and reasons for non-participation in exercise.19–21 However, there is only limited literature available on knowledge of PA measurement tools and guidelines by healthcare professionals. These papers are low powered, with relatively small sample sizes and are only regionally based.22–24 To the authors’ knowledge, this study is the first nationwide survey to comprehensively assess knowledge, use, and confidence in PA guidelines and tools of GPs. The knowledge and skills deficit identified by this study needs to be addressed in both undergraduate and postgraduate education, with more emphasis being put on PA in the clinical curriculum. Some provisions already exist that aim to improve GP knowledge on PA modification. One such scheme is the peer-to-peer PA clinical champions teaching programme. This service, created and provided by PHE, provides free structured training to health professionals by health professionals, to improve the understanding of PA in clinical practice so they can integrate very brief advice into their day-to-day clinical practice.29 To date, there have been six pilot regions focusing on doctors. The scheme is now being rolled out across the country, and expanded to allied health professionals. This is significant as, in the context of current pressures on general practice, the time required to even briefly discuss PA interventions is more likely to be available to the practice nurse or other members of the practice team than the GP. Another teaching tool available is the online BMJ learning tool on ‘physical activity in the treatment of long-term conditions’.30 This is comprised of nine e-learning modules on PA and health, plus a motivational interviewing module. Only 2% and 3% of total responders in this survey had undertaken either of these sessions, respectively. More needs to be done to increase GP awareness of these and other training opportunities. Given the potential gain in both patient and population outcomes, PA is an area that is ripe for exploration in both primary and secondary care. Further research is needed to understand how to maximise GPPAQ use for routine consultation to assess health risk and improvement in PA among patients. The authors thank Nick Cavill, Melvyn Hillsdon, and Beelin Baxter for their input on the advisory group for the survey design. They also thank MedeConnect Healthcare Insight (MHI), who were responsible for the collection and processing of data. Revision requested February 13, 2017. Physical activity, Fact sheet. Updated February 2017. http://www.who.int/mediacentre/factsheets/fs385/en/ (accessed 10 Jul 2017). (2011) Start active, stay active: a report on physical activity from the four home countries’ Chief Medical Officers (DH, London) https://www.gov.uk/government/uploads/system/uploads/attachment_data/file/216370/dh_128210.pdf (accessed 10 Jul 2017). (2013) Physical activity in adults (Health and Social Care Information Centre), Health Survey for England 2012. Volume 1: Chapter 2. http://content.digital.nhs.uk/catalogue/PUB13218/HSE2012-Ch2-Phys-act-adults.pdf (accessed 21 Jul 2017). , eds (2015) Health Survey for England, 2014 (NS) (HSCIC, London) http://content.digital.nhs.uk/catalogue/PUB19295 (accessed 10 Jul 2017). (2012) Effect of physical inactivity on major non-communicable diseases worldwide: an analysis of burden of disease and life expectancy. Lancet 380:219–229. (2011) The economic burden of ill health due to diet, physical inactivity, smoking, alcohol and obesity in the UK: an update to 2006–07 NHS costs. J Public Health 33:527–535. (2002) The economic burden of physical inactivity in England (MEDTAP International, London). (2012) Global physical activity levels: surveillance progress, pitfalls, and prospects. Lancet 380(9838):247–257. (2013) Physical activity: brief advice for adults in primary care. PH44 (NICE, London) https://www.nice.org.uk/guidance/ph44 (accessed 10 Jul 2017). (2015) Evaluation of reliability and validity of the General Practice Physical Activity Questionnaire (GPPAQ) in 60–74 year old primary care patients. BMC Fam Pract 16:113. (2016) Experiences of patients and healthcare professionals of NHS cardiovascular health checks: a qualitative study. J Public Health (Oxf) 38(3):543–551. (2012) Effectiveness of physical activity promotion based in primary care: systematic review and meta-analysis of randomised controlled trials. BMJ 344:e1389. (2008) Health Survey for England — 2006, CVD and risk factors for adults, obesity and risk factors for children (NS), http://content.digital.nhs.uk/pubs/hse06cvdandriskfactors (accessed 10 Jul 2017). (2015) Access to weight reduction interventions for overweight and obese patients in UK primary care: population-based cohort study. BMJ Open 5:e006642. (2012) NCD prevention: investments that work for physical activity. Br J Sports Med 46(10):709–712. (2016) Translating the World Health Organization 25×25 goals into a United Kingdom context: the PROMISE study, Final Report. https://www.richmondgroupofcharities.org.uk/sites/default/files/the_promise_study_final_report.pdf (accessed 11 Jul 2017). (2006) Smoking: brief interventions and referrals. PH1 (NICE, London) https://www.nice.org.uk/guidance/ph1?unlid=75383460120173192422 (accessed 10 Jul 2017). (2015) Awareness of moderate-to-vigorous physical activity: can information on guidelines prevent overestimation? BMC Public Health 15:392. (Oct 1, 2016) The relationship between attitudes, beliefs and physical activity in older adults with knee pain: secondary analysis of a randomised controlled trial. Arthritis Care Res (Hoboken) doi:10.1002/acr.23104, [Epub ahead of print]. (2016) Reasons for non-participation in a primary care-based physical activity trial: a qualitative study. BMJ Open 6(5):e011577. (2014) Physical activity assessment in practice: a mixed methods study of GPPAQ use in primary care. BMC Fam Pract 15:11. (2008) ‘Doctor, how much physical activity should I be doing?’: how knowledgeable are general practitioners about the UK Chief Medical Officer’s (2004) recommendations for active living to achieve health benefits? Public Health 122:588–590. (2013) Major limitations in knowledge of physical activity guidelines among UK medical students revealed: implications for the undergraduate medical curriculum. Br J Sports Med 47(11):718–720. Public Health England, https://www.gov.uk/government/organisations/public-health-england (accessed 10 Jul 2017). A leading provider of international healthcare solution driven research, https://www.medeconnect.net/ (accessed 10 Jul 2017). (2017) Macmillan’s programmes and services: physical activity, http://www.macmillan.org.uk/about-us/health-professionals/programmes-and-services/physical-activity.html (accessed 10 Jul 2017). (2009) Effect of the Quality and Outcomes Framework on diabetes care in the United Kingdom: retrospective cohort study. BMJ 338:b1870. (2016) Health matters: getting every adult active every day (PHE, London) https://www.gov.uk/government/publications/healthmatters-getting-every-adult-active-every-day/health-matters-getting-everyadult-active-every-day (accessed 10 Jul 2017). Physical activity in the treatment of long-term conditions, http://learning.bmj.com/learning/course-intro/physicalactivity.html?courseId=10051913 (accessed 10 Jul 2017).